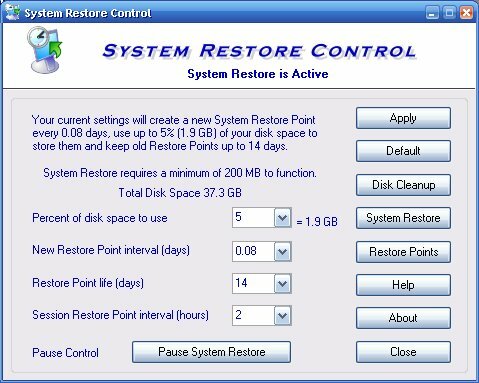 Windows XP System Restore default settings use up to 12% of your disk space, creates a Restore Point every 24 hours and keeps old points for 90 days before deleting. Microsoft doesn't provide any adjustments except for the slider where you may move it below 12% but any time System Restore is stopped/started/suspended or a check point is restored it automatically moves the slider back to its default of 12%. This uses up an enormous amount of space unnecessarily that could be put to better use. We only need the last good Restore Point or maybe the last few but certainly not one that's 3 months old. Using the settings that are right for you will save Gigabytes of space. 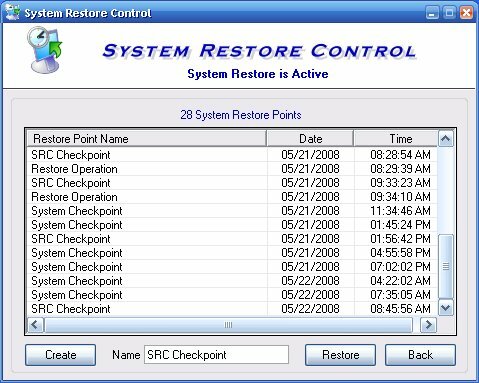 Change time to keep old Restore Points before deleting to as little as 7 days. Pause Control, for preventing Restore Points when making System changes or installing an application you trust..